This point is confirmed by recent research on short-term memory as well as Barbara Minto's Pyramid Principle work. In addition I have always found the "rule of threes" to be a helpful concept for simplifying and clarifying any communcation. 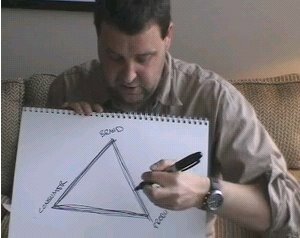 Watch Account Planner Russell Davies explain how drawing a triangle can solve any communication problem in the universe. Thoroughly enjoyed the video clip, thanks! I have a completely speculative theory that people also "conclude in threes"... or are willing to generalize and start using words like "all" or "every" after experiencing something simliar for the third time. I've downloaded the clip but cannot play it in Real Player or Windows Media. What application plays the m4v file type? I am not technically inclined, but on my PC the file opens up in Quicktime just fine. This looks like an extremely old post, however, still relevant, based on a recent post I read with a similar theme. I think we do think in threes, indulge me for a moment. The three muskateers, the three stooges, the three pillars of hercules. Noguchi + transparency = productivity! Are people receiving what you are transmitting? How do you get out of a rut?